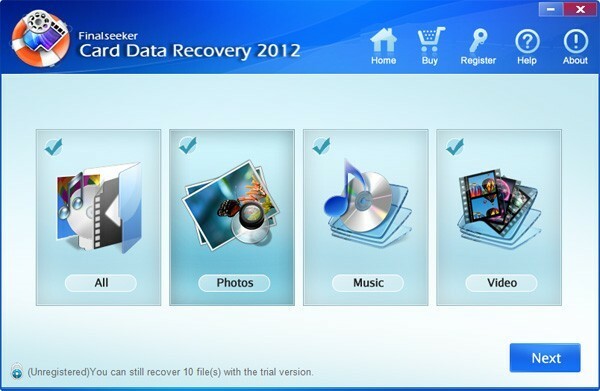 How to recover deleted files in windows xp is being made very straightforward and immediate by Finalseeker card data recovery tool. Users always have a fear of their data loss that can occur due to various reasons such as system failure, operating system errors, virus attacks etc. So, need for a disk data recovery software arises. Card data recovery tool facilitates any sort of data card recovery whether it be images, songs or movies, MS Office files, deleted files from your Hard Drives, Floppy Drives, USB devices, ZIP drives etc. So now the question How to recover deleted files in windows xp no longer bothers the users. This Disk data recovery software can be easily downloaded from our site. Demo version of disk Data Recovery software is downloadable free of cost for evaluation, user can preview the lost data but cannot save it without a license and the licensed copy is priced at $24 only. Various versions of windows (95, 98, ME, XP, 2000, 2003, 2007, Vista, 7) are supported by this Card Card Recovery tool and it supports various data storage devices too. Syncios Data Recovery - Syncios data recovery helps to retrieve lost data including photos, messages, contacts, text messages, as well as App data like WhatsApp conversations, iPoto, Instagram etc. Recover iPhone, iPad and iPod easily in just 3 steps: Connect>Scan>Recover. Leawo iTransfer - Leawo iTransfer is the combination of an iPod Transfer, iPhone Transfer and iPad Transfer which can transfer data among iOS devices, iTunes and computer. With it, users can copy data files from one Apple device to another device with ease. Syncios - Syncios is an easy-to-use yet powerful smartphone manager, which enables to transfer, manage or backup apps, photos, music, videos, eBooks and more between iPod/iPhone/iPad/Android and PC quickly and easily. SynciOS for Mac - Free iPhone/iPod/iPad manager for Mac users. Full freedom to transfer music, videos, contacts, photos, bookmarks, notes and more from iPhone, iPad and iPod to iTunes Library & Mac. Extract photos, contacts and more from iTunes backup to Mac.